The Washington Capitals entered the 2017-18 season still stinging from their latest playoff disappointment months earlier after another dominant regular season. But the team retained its captain, Alex Ovechkin, and its core, including goaltender Braden Holtby and standouts such as Nicklas Backstrom, Evgeny Kuznetsov and T.J. Oshie. After a solid if uneven regular season, the Capitals entered the postseason without the crushing expectations of years past but also no assurance that this year would be different, especially after losses in their first two playoff games. Then something special happened: Ovechkin led with both his play and emotion, Holtby rekindled his magic in net, rookies complemented veterans and the franchise found itself in unprecedented heights: hoisting the Stanley Cup. Relive the magical run through the images and words of The Washington Post photographers and reporters that followed the team every step of the way. The Washington Post was founded as a newspaper in 1877. The company is based in Washington, D.C.
On June 7, 2018, the Washington Capitals defeated the Vegas Golden Knights in five games and claimed their first Stanley Cup in over 40 years. Less than a month after the 2018 Stanley Cup Finals came to its earth-shattering end, the story of the Capitals' rise to the height of sports fame leaves many captivated by their unexpected triumph and some curious to know how they pulled it off. A moving introduction from Washington Post sports columnist Thomas Boswell, who witnessed the Capitals' disastrous inaugural season in 1973. Color photographs of key moments from the 2017-18 season, the Playoffs, the Eastern Conference Finals and the fateful Stanley Cup Finals. Detailed accounts of each of the five nerve-frying games from The Washington Post reporters who covered them. 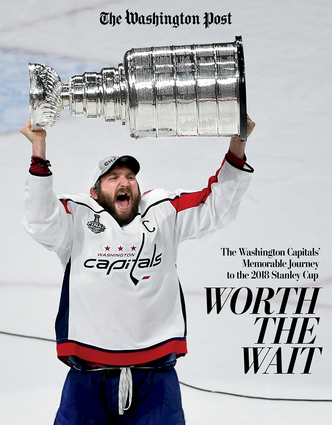 An intimate look at an unforgettable moment in sports history, Worth the Wait: The Washington Capitals' Memorable Journey to the 2018 Stanley Cup is the ultimate must-read for anyone who wants to know more about how the veteran ice hockey team made its's most major achievement.